Matilda Strachan (n. Potts) convicted of Vagrancy and sentenced to 3 months hard Labour at Darlinghurst Gaol. Matilda Strachan was convicted of Vagrancy at Redfern Court, 7 April 1888 and sentenced to 3 months hard labour at Darlinghurst Gaol, New South Wales, Australia. Release date 6 July 1888. Matilda Strachan (n. Potts) on 20 Feb 1891, at Windsor Court, was convicted of Vagrancy and sentenced to 2 months gaol at Darlinghurst Gaol, sentence to expire 18 April 1891. Matilda Strachan (n. Potts) on 20 February 1891 was trialed at the Windsor Court House and convicted of Vagrancy. She was sentenced to 2 Months prison at the Darlinghurst Gaol, New South Wales, Australia. Her sentence began on 21 February and was released on 18 April 1891. Report on the trial of Matilda Strachan (n. Potts) for Vagrancy. The trial of Matilda Strachan was conducted at the Windsor Police court Friday, 20 Feb 1891. She was charged with vagrancy and sentenced to two months in Darlinghurst Gaol. This article was published in the Windsor and Richmond Gazette Newspaper, Saturday, 21 February 1891, page 4. Matilda Strachan (n. Potts) was charged on warrant that she did on the 9th day of July 1881, marry James Strachan, and that whilst so married, did on the 8th day of October 1907, marry Henry Scott, the said James Strachan being then alive, was arrested and commited for trial at Quarter Sessions, Sydney, New South Wales. Matilda Strachan was arrested and charged on warrant that she did on the 9th day of July 1881, marry James Strachan, and that whilst so married, did on the 8th day of October, 1907 marry Henry Scott, the said James Strachan being then alive, and committed to trial at the Sydney Quarter Sessions. Bail was allowed. This index shows the scheduled date of the trial of Matilda Strachan (n. Potts) at the Sydney Quarter Sessions. Friday 11 December 1908, at the Redfern Police court, Matilda Strachan, aged 49, was charged with bigamy and committed for trial at the Sydney Quarter Sessions. Bail 25 pounds. At Redfern Police Court, Matilda Strachan of Redfern was charged with bigamy, it being alleged that she married James Strachan, at Windsor in 1881 and while Strachan was alive she married Henry Scott at Redfern, on October 6. She was committed for trial. Sydney, Thursday 10 Dec 1908, Matilda Strachan, aged 49, was committed for trial on a charge of bigamy. It was alleged that she married James Strachan at Windsor in 1881 and while Strachan was still alive she married Henry Scott at Redfern in 1907. This article was published in the National Advocate Newspaper, Bathurst, New South Wales, Friday 11 Dec 1908, page 2. 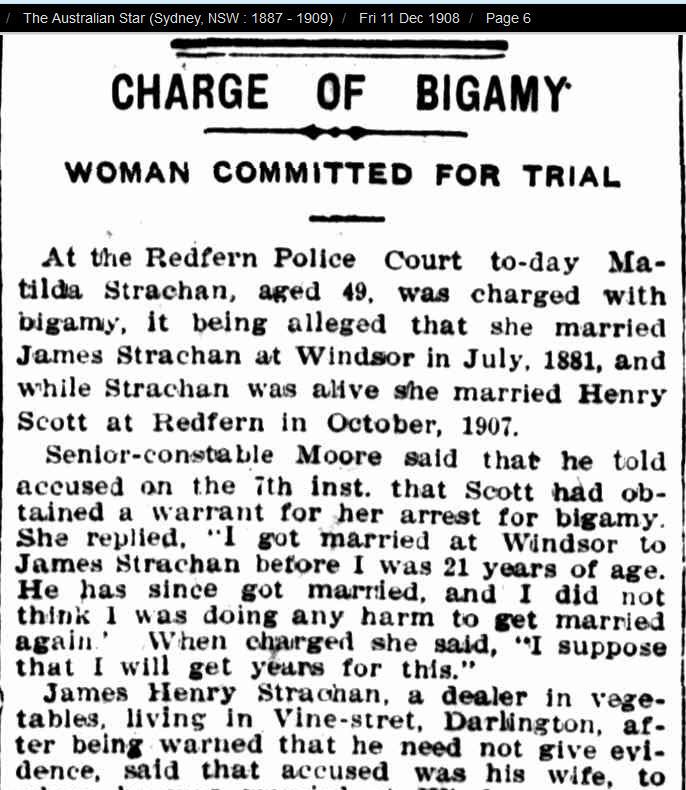 On Thursday 10 December 1908, At the Redfern Police court, Matilda Strachan, 49, was charged with Bigamy. Matilda reserved her defence, and was committed for trial, Bail was allowed. This article was published in The Sydney morning Herald newspaper, Friday 11 December 1908, page 9. Matilda Strachan (n. Potts) was trialed before the Sydney Quarter Sessions and convicted of Bigamy and sentenced to 3 months Gaol at the Darlinghurst Gaol. She had been interned since the 10th December 1908. New South Wales, Criminal Court records, Clerk of the Peace, 1909 Register - Matilda Strachan (n. Potts). On the 1st February 1909, Matilda Strachan was trialed and found guilty of Bigamy. She was sentenced to 3 months Gaol at Darlinghurst Gaol, New South Wales, Australia. Witnesses for the Crown were Senior constable Moore, James Strachan, Henry Scott (Snr), Henry Scott (Jnr) and Louisa M Kennedy. Matilda Strachan (n. Potts) was arrested and charged with bigamy on 7th December 1908. She was interned at Darlinghurst Gaol on the 10 december 1908 awaiting Trial at the Sydney Quarter sessions. Bail was granted, but it appears she could not raise it and remained in gaol until her case was heard. On the 1st February 1909 she pleaded guilty to Bigamy and was sentenced to 3 months Gaol at the Darlinghurst gaol. Matilda Strachan, found guilty of Bigamy at the Sydney Quarter Sessions, 1st February 1909 and sentenced to 3 months Gaol. Matilda Strachan Pleaded Guilty at the Sydney Quarter Sessions court and was remanded for sentence. This article was published in The Sydney Morning Herald Newspaper, Tuesday 2 February 1909, Page 10. Matilda Strachan pleaded guilty to a charge of bigamy. She was married to James Henry Strachan at Windsor on July 9, 1881, and while so married, she went through the form of marriage with Henry Scott, on October 1907, at Redfern, her husband being then alive. She was sentenced to three months imprisonment, with light labour, at Darlinghurst gaol, cumulative upon a sentence of two months she was undergoing. James Henry Strachan married Matilda Griffiths Potts 9th July 1881 at St Matthews Church Windsor, New South Wales, Australia. St Matthew's Anglican Church at Windsor is the oldest Anglican Church in Australia (1886) and the second oldest of any denomination, after the small Uniting Church nearby at Ebenezer. Governor Macquarie who ordered the building to be erected believed that religion was an important element for all classes of people and for the betterment of the nation. Henry Scott said that when he married Matilda Potts he did not know she was previously married. He found out sometime later, at the markets, that she was Married, so he left her. It was after Matilda filed a warrant against him for wife desertion,that he filed the Bigamy charge against her. Matilda Potts b.1860, Richmond, New South Wales, Australia. [S4] NSW BDM, New South Wales Government, 11857/1860 (Reliability: 3), 1860. See attached birth registration transcription for Matilda G Potts. [S472] Nina Moxham (n. Dillon) (Reliability: 3). [S442] Ann Patricia Moxham (n. Snelling). [S207] State Archives of New South Wales (Reliability: 3), 7 Apr 1888. See attached copy of Gaol Description and Entrance book, Darlinghurst Gaol for Matilda Strachan (n. Potts). [S207] State Archives of New South Wales (Reliability: 3), 21 Feb 1891. See attached copy of Darlinghurst Gaol Entrance Book for Matilda Strachan (n. Potts) 21 Feb 1891. [S207] State Archives of New South Wales (Reliability: 3), 16 Dec 1908. See attached copy of Police Gazette and Weekly record of crime, No. 51, Wednesday 16 December 1908. [S207] State Archives of New South Wales (Reliability: 3), 1 Feb 1909. See attached copy of the NSW Criminal court records calendars of the Sydney Quarter Session, 1st February 1909 - Matilda Strachan. [S94] The Sydney Morning Herald, 8 (Reliability: 3), 24 Sep 1931. See attached death notice published in The Sydney Morning Herald Newspaper, Thursday 24 September 1931, Page 8. [S4] NSW BDM, New South Wales Government, 10475/1931 (Reliability: 3), 1931. [S94] The Sydney Morning Herald, 7 (Reliability: 3), 24 Sep 1931. See attached death notice published in the Sydney Morning Herald Newspaper, Thursday 24 September 1931, page 7. [S2] A history of the Potts Family, Geoffrey William Potts, 87 (Reliability: 2), 25 Jul 1855. [S4] NSW BDM, New South Wales Government, Reg No. V1855798 43B/1855 (Reliability: 2), 1855. [S4] NSW BDM, New South Wales Government, 4307/1881 (Reliability: 3), 1881. See attached NSW Marriage Transcription of Matilda Potts and James Henry Strachan. [S472] Nina Moxham (n. Dillon). [S4] NSW BDM, New South Wales Government, 034137/1896 (Reliability: 3), 29 Oct 1896. See attached birth certificate 1896/034137 George Henry John Needham. [S94] The Sydney Morning Herald, 9 (Reliability: 3), 11 Dec 1908. [S4] NSW BDM, New South Wales Government (Reliability: 3). There were no children born to this marriage. [S4] NSW BDM, New South Wales Government, 4672/1907 (Reliability: 3), 1907. Matilda Potts married Henry Scott,1907,District: Redfern, New South Wales, Australia. [S207] State Archives of New South Wales, 448/1908 (Reliability: 3), 16 Dec 1908. See Attached copy of New South Wales Police Gazette and weekly record of crime,NO. 51,Wednesday, 16 December 1908, Bigamy, Redfern, Matilda Strachan. [S94] The Sydney Morning Herald, 9 (Reliability: 3), 11Dec 1908.